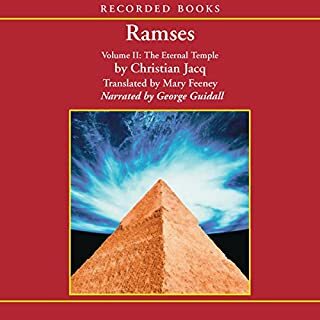 The new Pharaoh, Ramses, aspires to greatness of a magnitude undreamed of by mortal men. But to thwart his dreams, a gaggle of fiends, including a sorcerer, invaders, and his own brother awaits him. Now he will learn whether the friends of his youth - people such as Moses and the aging Greek poet, Homer - can truly be trusted. Enjoyed very much listening to them again. I read them before my first trip to Egypt and i was so glad i did. Our tour guide was so surprised i was so familiar with Ramses II. 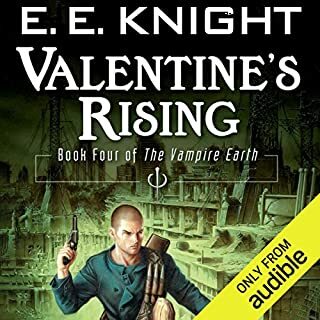 I just wished the rest of the volumes were available through audible. Not enough meat. 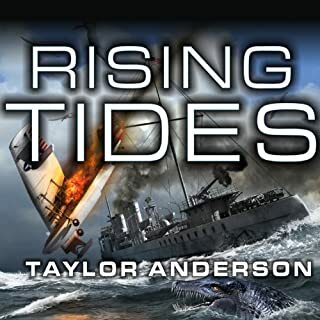 Slow paced and stilted narration. Red eye and Odins wolves much better reading. Great material, just needs better execution. As usual I loved the books but the voice of Bones was annoying. If there were more of his voice, I'd just read them. Glad I didn't ever "read" the series because then it would be intolerable. I could do a better male English than that annoying pittance. Can't see a hunk with that voice. Come to think of it I stopped listening to old Camiin series for such a voice. Would you try another book from Margery Allingham and/or David Thorpe? I have enjoyed Allingham over the years, usually in paperback. 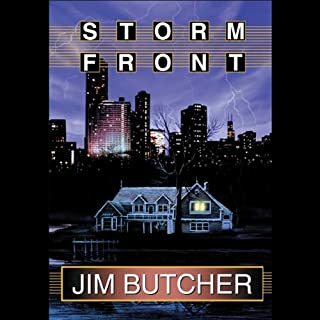 I decided to try a couple of novels in audio. I am glad I tried two because had I only listened to Thorpe's narration I would not have bought any additional books. 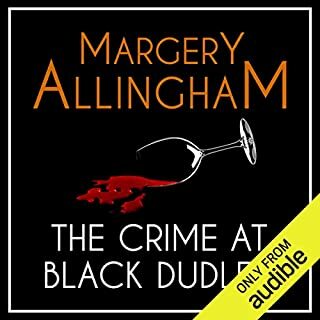 Allingham always has some fun as well as intrigue in her books. 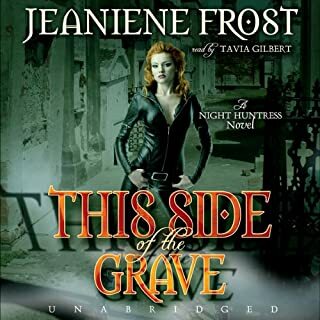 Her plots are usually a little more complex than many of the English cottage mystery writers. Campion is a character who grows on you much like Lord Peter Wimsey. While we know that Campion, like Lord Peter, puts on a facade of sorts - looking to appear the fool when he is not, this narrator made him sound like a hysterical alley cat. Other times he has him "twitter". I was so annoyed. I can't imagine anyone enjoying Campion with this voice attached. Fortunately I had bought one with another narrator at the same time and was pleased. Its too bad that most of the audio editions use Thorpe. I am not that picky about narrators compared to most, although I have my favorites like most listeners. This is the first time I have boycotted a narrator for reasons other than difficulty in understanding an accent, etc. If you want to read Campion, make sure you try one of the books with another narrator and then you will at least understand the main character before you hear Thorpe destroy him. 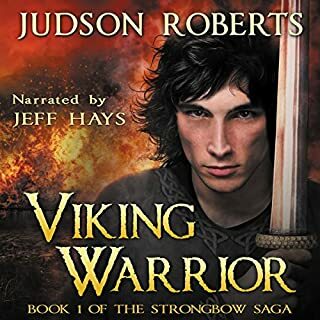 I hope there are some other versions of the series with a different narrator. Otherwise I'll limit myself to non Thorpe narrations. Ozark Free Territory, 2071: The Kurian Order has reigned for 50 years. Using the dreaded power of their Reaper avatars, the alien, vampiric Kur hold dominion over the Earth and its inhabitants. Yet there are those who would rather die fighting than surrender to the unquenchable thirst of the enemy - those like David Valentine . More of the same - but that's a good thing! A Solid Series, Well worth the credit(s)! Well written and well performed sci fi. Although the plot is old (aliens having taken over the earth and the survivors continue the battle), this series was pretty refreshing. Good characters, intelligent story telling that doesn't drag, reasonably good balance of action and character development. Its not a five star, but worth the credits as the series will provide you with many hours of entertainment. 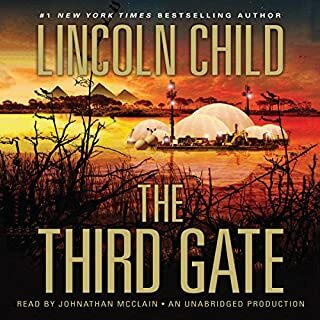 Definitely recommend starting with book one of the series for best reading/listening. A Highly Entertaining Series, one of my favorites! Who doesn't love a great series that is imaginative, well written, with wonderful characters and lots of action? i listen or read two or three books a week and am always on the lookout for good, entertaining series. These characters are so vivid that I become totally enveloped in the alternative world. Imaginative entertainment for adults. Well produced and well worth the credits for the series. Under the direction of famed explorer Porter Stone, an archaeological team is secretly attempting to locate the tomb of an ancient pharaoh who was unlike any other in history. Stone believes he has found the burial chamber of King Narmer, the near mythical god-king who united upper and lower Egypt in 3200 B.C., and the archaeologist has reason to believe that the greatest prize of all - Narmer's crown - might be buried with him. No crown of an Egyptian king has ever been discovered, and Narmer's is the elusive crown of the two Egypts. The basic underlying plot was a bit hokey. Yet this author always delivers good characters, a smooth and entertaining narrative. Found the setting interesting but just felt the storyline was too contrived and fell short of the author's usual standards. This may insult some people's intelligence. 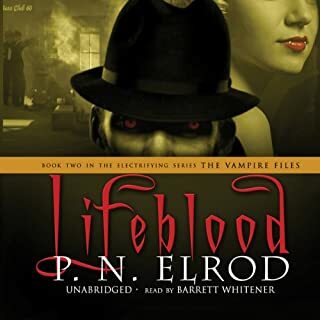 The Vampire files are typical P N Elrod: light escapism without insulting your intelligence. The hero's character is charming, the other main characters interesting, and the story was never boring. A good listen and worth the credit. 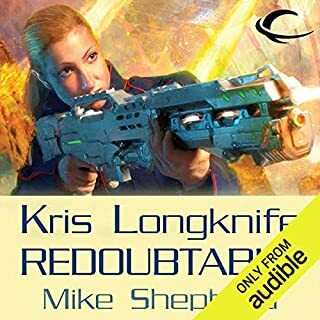 Lieutenant Commander Kris Longknife has precise orders: seek out, engage, and destroy pirates, slavers, and drug lords operating beyond the rim of human space - without interfering in Peterwald family affairs. But when slavers kidnap a 12-year-old girl, Kris's mission becomes personal. And if destroying the pirate compound flattens some Peterwald interests - well, to hell with politics. Would you listen to Redoubtable again? Why? I am always looking for entertaining series that are easy to listen to and provide some escapism from academia and the evening news. The Kris Longknife books, while not cerebrally demanding are fun, creative and just good value for one credit. They are light but don't insult my intelligence and provide a nice balance of political intrigue, action, romance, and good characters. I will buy them all.